When pitted one against the other, the heroes rationalize their own importance at the expense of their comrades' lives. 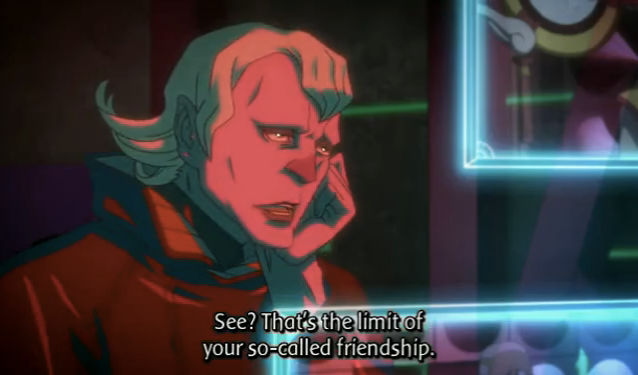 It’s hard to believe that the end of Tiger & Bunny is the death of every hero, and of course EVERYONE doesn’t die. Sadly we get a tragic ending nonetheless. It’s been a pretty wild ride, and I enjoyed getting to know the heroes. This series did a pretty good job of living up to its potential. It was full of eye candy. The CGI was tastefully employed. I really enjoyed The expressive postures that Kotetsu would strike in his battle suit; it really gave what could have seemed sterile a human dimension. Also there were plenty of characters that were fun to see each week, even if they weren’t all as well-developed as Kotetsu. An interestingly short post. The calm before the storm of the final post? Something like that, yeah. This is the point where speculation seems pointless, general comments have already been made, and final thoughts are premature. I did like that picture, though.